It may be spring, but there’s still time to appreciate Paul S. Piper‘s 2010 Walk Award-winning poem, To a Slug in Winter, which he reads here on YouTube, thanks to BTV10. You can also read Paul’s poem here. We’ve added a Winners page! 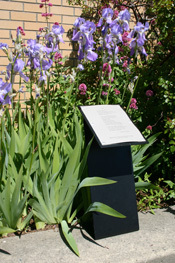 Click on Winners (above) to see a list of Sue Boynton Poetry Contest winners from each contest year, 2006 through 2011. As time allows, we’ll add links from the lists to the poems. You don’t have to wait for the May 12 awards ceremony to hear 2011 winning poet Caleb Barber read his poetry! Barber will read from his book Beasts & Violins at Village Books on Tuesday, May 10, 2011 at 7:00pm. The book’s title poem appeared in Best American Poetry 2009. Also reading that evening will be poet Maya Jewll Zeller. Event details here, or have a look at Caleb Barber’s website. Be a poet. Be a friend of poetry. Every month is poetry month. See and hear Kim Roe reading her 2010 winning poem, After Being Called “Girlie” at the Hardware Store, on YouTube – or read Kim’s poem here. Special thanks (again) to BTV10. All of this year’s submissions are currently on display in the gallery at Mindport Exhibits, 210 W. Holly Street, Bellingham, through Sunday, May 8, 2011. Poets and their families will be admitted to the gallery without charge. Mindport is open Wednesday through Friday 12-6, Saturday 10-5 and Sunday 12-4 (closed Monday and Tuesday).